Thanksgiving is a time for giving thanks, spending time with friends and family, good food, and football (and lots of it, food, family and football!) It has also become a holiday where, not long after leftovers are put away, people search for great deals on their Christmas shopping list. On Thanksgiving Day, November 27th, thousands of diehard shoppers will travel to Smithfield for “deals on top of deals” offered at Carolina Premium Outlets, which has stores opening their doors at 6pm this year. It&apos;s quite the sight to see, lines in front of stores, waiting to get the best deal on items like Coach bags. We love that visitors travel here from all over the state and beyond making a weekend trip to Smithfield. We wish everyone a wonderful Thanksgiving and that they get a great deal at Carolina Premium Outlets. If you are coming shopping - here are the details! The Extra Festive Weekend Sale featuring extended shopping hours are 6 p.m. on Thanksgiving Day, Thursday, November 27, 2014, through 10 p.m. on “Black Friday,” November 28, 2014. 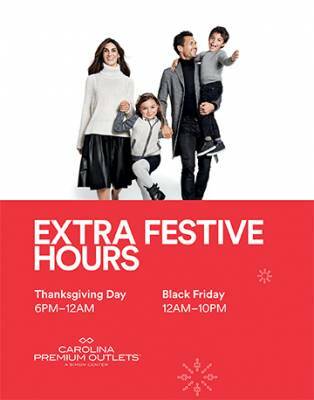 On Saturday, November 29, the Center will open at 8 a.m. and close at 10 p.m., and will open on Sunday, November 30, at 10 a.m. and close at 8 p.m.
Carolina Premium Outlets is offering extra holiday hours to meet their customers’ needs - from the person looking for the latest fashion and styles of the season, to the family hunting for great deals, to the last-minute shopper in search of the perfect gift....with an impressive collection of fashion labels at savings of 25 to 65 percent every day for our shoppers during the holiday season. Shoppers will enjoy exceptional holiday savings and extended shopping hours, plus, they will experience the biggest shopping event of the year. Shopper appreciation programs will take place throughout the holiday season and include: random acts of gifting, holiday gift cards, holiday entertainment, and complimentary treats at Guest Services. 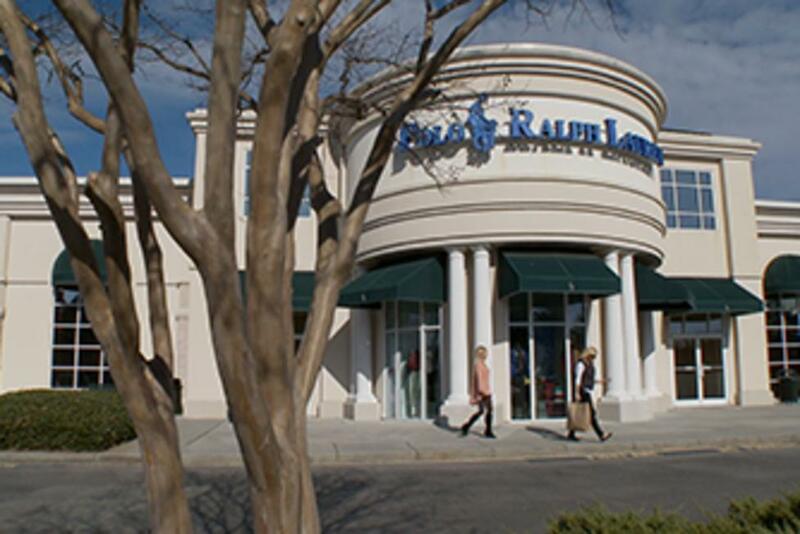 For the most up-to-date information, to check on store openings and special offers, visit the center’s website: www.premiumoutlets.com/carolina. For hotel deals and places to rejuvenate and have a bite to eat, visit the official visitor website for Smithfield, www.visitsmithfield.org.